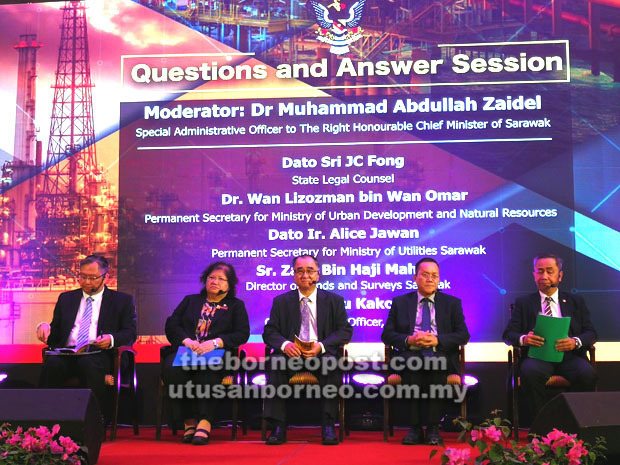 (From left) Permanent Secretary for Ministry of Urban Development and Natural Resources Dr Wan Lizozman Wan Omar, Permanent Secretary for Ministry of Utilities Sarawak Dato Ir Alice Jawan, Fong, Saau, and Lands and Survey Department Sarawak director Zaidi Mahdi are seen during the industry engagement session yesterday. KUCHING: With just two more months before Sarawak state-owned Sarawak Petroleum Bhd (Petros) assumes full regulatory authority over the upstream and downstream aspects of the state’s oil and gas (O&G) industry, existing industry players are wondering if their business activities will be impacted. The need to reapply for licenses and leases has been an area of concern for many existing PSCs holders, but Saau guided that the process of reapplication will be streamlined in order to ensure that there is a smooth transition of regulation to Petros and to protect the existing investments in the state while encouraging more investments to take place. Adding to this, State Legal Counsel Dato JC Fong emphasised that the process would not jeopradise any entities currently undergoing any exploration, prospecting of petroleum or mining as they would be provided with an interim approval or short-term license while their applications are under consideration with Petros. It is understood that these short-term licenses and leases will be valid until the end of 2019. And for service providers, Saau adds that existing processes would be streamlined so that only one license would be applicable for service providers to continue their work in the state. “For existing Petronas qualified service providers, you will need to reapply for a license with Petros but it will be a very straight forward process so as not to affect your business processes,” he said. Regarding the fees involved in submission of applications, annual licenses, lease fees and annual land rent, Saau guides that they will be advised in due course. Besides acting as a regulator, Petros will also be aiming to become a major player in the exploitation and utilisation of energy resources in the state and aspires to become a viable entity as soon as possible. “For the onshore part, there will be some work we can do there as the state has already issued a mining lease to Petros. It is an area that we will definitely put some priority on. “And for the gas distribution, we will work with the ministry in order to understand exactly where we want to go that and knowing as well that the supply of gas is required in order for you (PSCs) to expand the downstream end of the business,” said Saau. While it is understood that the current gas supply is rather stretched from ensuring that all existing facilities in Bintulu are filled up, Saau added that Petros would be placing additional investment to ensure that current levels are sustained in order to drive more downstream investment or value-added type industries. The encouragement for more downstream and valued-added investments is in line with the chief minister’s call during his keynote address for all industry players to diversify their earnings through overseas expansion or through other domestic growth segments like specialty chemicals such as methanol derivative and new alternative energy sources such as hydrogen production which the State is currently embarking on.